by Andy Higgs in Europe, Features, Places, Sweden. After covering Berlin in our first post and Paris in our second, we move on to Stockholm which also has plenty to offer in December; and winter is a great time to visit. The city is beautifully illuminated after the sun sets, which is early at this time of year as the days are short. This is the oldest and most traditional Christmas Market in Stockholm and is open each day from 11am to 6 pm until Dec 23. It’s location right in the heart of the Old Town (Gamla Stan) at Stortorget square (close to the Royal Palace) all but ensures the right atmosphere, and you will be able to find Swedish Christmas sweets, reindeer and elk meat, smoked sausage and other delicacies, glögg (mulled wine/Gluhwein) and a variety of Swedish arts and crafts. When you’re done at the market make sure you wander through the picture-postcard cobblestone streets of Gamla Stan. Here you will find an established Christmas market each day from 11am to 6pm, with wares such as textiles and wooden crafts, gastronomic delights from the forests and seas, warm clothes (a good idea) and other potential gifts. There is also a small stage at one end of the market and a variety of entertainment is on offer at the weekends. 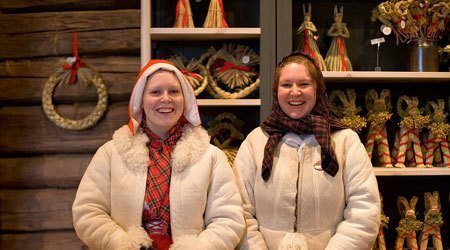 The ‘living museum’ at Skansen offers an old-fashioned Swedish Christmas experience at Bollnäs Square and in the Town Quarter. You will find handicrafts, great food and sweets and an enticing atmosphere. Check out the video below for a taster. 35 minutes on the train from downtown Stockholm (and covered by the SL transport card) it’s well worth heading out to Sigtuna. Not only does it have these two Christmas markets, it is also the oldest town in Sweden, dating back to 980 AD. The traditional Christmas Market offers Christmas items, handicrafts and traditional Swedish food items as well as live music and naturally a visit from Santa himself. The open-air market is held along the main street and on Main Square and Little Square. The town’s cafes, shops and restaurants are all open during market hours too. Sigtuna also hosts the largest indoor Christmas Market in Stockholm in the stone barn at Steninge Castle. I have always been crazy about Christmas markets, especially when our family focuses on the traditional meal with close family and friends and try to stay clear of crazy amounts of presents. Here in France we have the Narbonne Christmas markets where you can order your bird well in advance, find specialty cheeses and unique gifts too. Hope to make it to Sweden soon. Christmas markets are fabulous for finding that unique and arty gift. This looks like a great place although cold brrrr!